Tune in on Monday, August 4th as we celebrate the 113th birthday anniversary of one of jazz's foundational figures, the great Louis Armstrong. We will be preempting all regular programming that day as we honor Pops with 24 hours of swing. 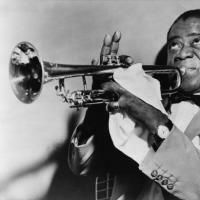 In his autobiography, Swing That Music, Louis Armstrong titled the first chapter “Jazz and I Get Born Together.” Dating his birthday July 4, 1900, Armstrong created a mythology that linked his own birth to the birth of Jazz and the birth of America. While he may have fibbed about the exact date, he was not wrong to connect his life with the beginnings of this American art form. He grew up surrounded by music in New Orleans and in 1922, he joined Joe “King” Oliver’s Creole Jazz Band in Chicago, the burgeoning epicenter of Jazz at the time. In 1924, as the Jazz scene grew in New York, he brought swing to Fletcher Henderson’s orchestra. His approach to swing became the definitive sound of his era. Recording with the Hot Fives and the Hot Sevens, he took New Orleans polyphony to its pinnacle. He went on to make many classic recordings in collaborations with jazz greats including Ella Fitzgerald, Dave Brubeck, and Duke Ellington, and with his larger ensembles. His expression on the cornet and trumpet was complimented and contrasted by his singular vocal style. He was lauded in his own time, and his recordings have been cherished by generations. We will preempt all regular programming all day on Monday, August 4th to feature his music.